The early phenomenon of Old Wainds played an extremely condensed and straightforward style of black metal that represented the ultimate distillation of what the genre had to offer as a sequence of meaningful flows based on guitar riffs that form aggressively articulated phrases the pressure of which is carefully regulated. The project was a great exception to the reliable rule that says, from experience, that black metal (or metal music in general) from Slavic countries has nothing to offer musically. More often than not, what is called “slavic black metal” is anything but, and in the best of cases falls into what has been misleadingly and ironically called “flowing black metal” to describe a pointless, melodic meandering rock music that lacks significant changes in pacing and texture, and so never is never able to produce the necessary dynamics of tension and release. Alas, Old Wainds plays the exalted and unassuming post-1995 black metal form first seen in the condensed masterpiece of Uranium 235, crushing the heads of the genre as a whole, dividing the line between mundane scenester fanboys and solitary black mystics. Навь (Nav’) was Old Wainds’ twin project, in which at least one of the band members differed. Musically, what distinguished the two was a the attempted emphasis of Nav’ on more fluid tendencies and softer contours, even if ever so slightly in comparison to Old Wainds. Nav’s distinct aim is arrived at in their first full-length, Чертоги смерти (2004), which basically was a pleasant but weak exposition of the melodic component already present in the best of Old Wainds’ music. While Old Wainds from the beginning has a very narrow style, in the sense of being impressively mature and well-formed, rather than incapacitatingly rigid, Nav’ expresses the riffing and melodic avenues that are left over from the former, but which still fall within this aggressive, dark music. In time, both projects fell out of grace by their own hand, in a rather telling way that perhaps reveals who the artistic luminary was in both groups. While Kull only participates in the Nav’ demo that is reproduced in this split, along with the second Old Wainds demo, he participates in Old Wainds in every release until Oбжигающий холодный —Scalding Coldness— (2005), a comparatively weakened but still recognizable expression of the project founded on proper black metal riff-flurry. After Kull leaves Old Wainds, the music changes drastically in to a completely uninspired imitation of itself, a sign that the departing element in the team was the author of the significant phrases at the center of the music. This is also true of Nav’, whose best work is found in their 1998 demo Гимн холодному безмолвию, reproduced in this split, and which sees the only apparition of Kull in the project. 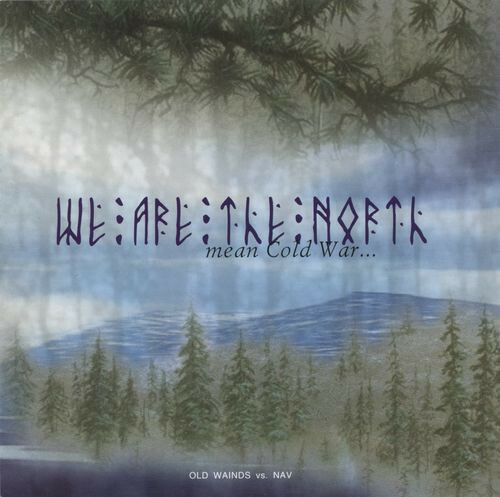 Furthermore, after their first full length, Where the Snows are Never Gone (1997) —and with the exception of this split which uses material from the second demo from 1999— Old Wainds’ songwriting was suffering from debilitating notions ever since their second full-length album. We sense a lost grasp or connection to the powerful pulse that created a maelstrom around an inward-looking conversation between the riffs, which can only be described as a vortex of encircling energy. The energy in a void whence arises this power is said inner dialogue of the music, that can only be achieved by two necessary elements: the first is that each section must have a clear and significant fluxion  expressed; and the second, consequent of the first, is that these fluxions must achieve a certain dynamic flow in between each other. The interaction between the individual fluxions is most excellently demonstrated in Old Wainds’ debut, and consists in the sense achieved by the parts arranged in sequence, first of all, but also in how they match simultaneously. They who grasp the meaning of this lexic contradiction, but that is not a contradiction in the phenomenon described, may have a first key to unlocking the more effective value of this black metal to the more superfluous acts considered de rigueur.